Councilor Klarissa Peña is proud to announce the opening of Sierra Sunset Park, located at Amole Mesa and Messina SW. 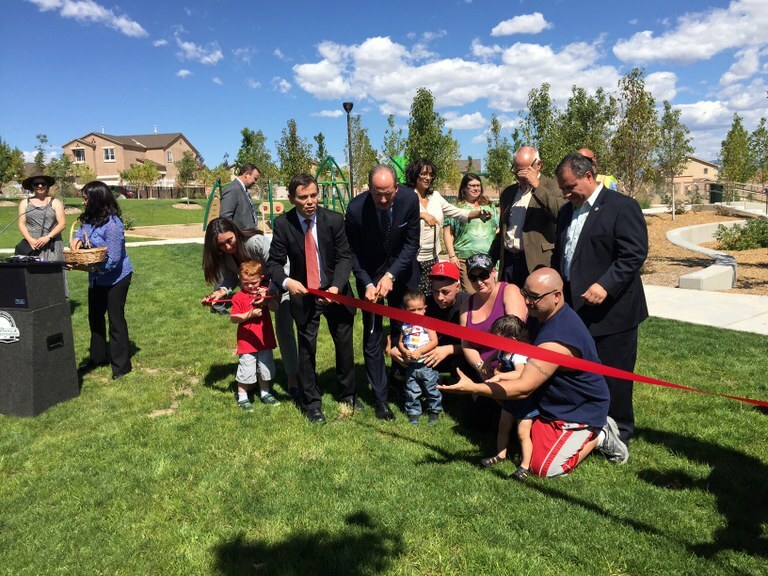 The new park brings much-needed recreational space for families in Southwest Albuquerque. Councilor Peña would like to thank Mayor Richard Berry and the Parks and Recreation Department for their commitment to complete the design and construction of the par. She is especially grateful to City of Albuquerque residents for their approval of the GO Bond that provided the dollars. She is most appreciative to City Councilor Ken Sanchez, who formerly represented the area for his tireless efforts to ensure that this park would get built and to the City Council who gave approval for the initial appropriations. The 6.8-acre-park boasts two new innovative playgrounds for two sets of age groups (2-5yrs. old and 5-12yrs. old). Designers integrated trees, shrubs with traditional playground equipment to create natural shade and a new playing experience for our children. There is also a large open grass area (4.8 acres) for practices and games, a walkway, picnic tables and a whopping 280 new trees. Like many Albuquerque parks, Sierra Sunset also functions as a basin for catching storm water after large rains. The basin is a surge pond, so if a storm drainage system backs up it will pool into the pond. This is a good example of how the city can jointly use park facilities for recreation and storm water management, keeping clean water on-site to infiltrate back into the into the aquifer. We remind dog owners to clean up their pets at all parks and open spaces, especially in areas being utilized for storm drainage.